This website is brought to you by the Keyless Locks Store. We are a small, US-based Internet business located in the Chicago area, providing jobs to Americans. All sales, customer support and shipping — in fact, all jobs — are right here in the USA. What that means to you is easier communication, better customer service, and faster shipping times-in-transit. When you buy from us, you’ll get the personal attention and support you need, AND you’ll feel proud that you are helping us support the American economy. We're also one of the oldest and largest Lockey resellers online — we've been selling Lockey locks online since 1997 — longer than anyone else! We've sold over 20,000 locks to customers in the US and around the world. We specialize in Lockey keypad (combination) entry door locks and accessories and we carry the full Lockey product line. We really know our products and want to help you find the right lock for you! Our customers say we have the best quality products along with the most informative and easy-to-use website. And our customer service just can't be beat. At our low prices, that's a winning combination! We have a variety of beautiful finishes and styles that look good in an office or at home. 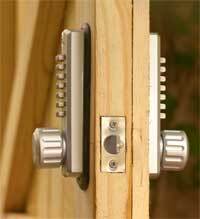 Our door locks are extremely simple to install and operate. You can change the combination yourself in just minutes! Our merchandise is brand new—no used, returned, or re-stocked items. If you buy a keyless lock from us, you can count on it to protect you and your loved ones, your home, apartment or dorm, and your business--for years to come. We have built our online business since 1997 with referrals from thousands of happy customers just like you, so please tell your friends about our products and service!